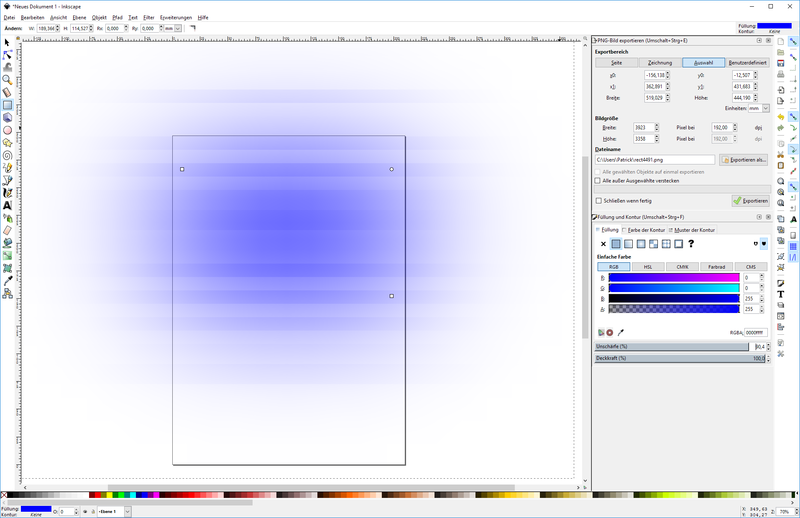 When zooming far into a blurred region (or setting a large blur radius) artifacts appear in the rendering of the Gaussian blur filter (horizontal stripes with changing color, see screenshot). The screenshot was made with Inkscape 0.92.0 (64-bit) on Windows 10 x64 but current trunk (r15415) is affected, too. The issue is dependent on the rendering quality set in preferences: The lower the quality setting the earlier (i.e. for lower zoom, smaller blur radius) the artifacts become visible. Only for the highest quality setting I could not see any artifacts (but rendering gets so slow on my machine that i can't zoom in very far, so I can't completely rule out that it's affected, too). I tested with default (new) prefs for each run. Confirming based on my tests as quoted from irc. The mentioned tests had been done with archived trunk builds on OS X 10.7.5, with default (new) preferences for each run. Definitely related to tiling. With trunk one can now visualize the tiles by uncommenting a line in src/desktop.cpp (canvas_debug) to see the tiles. Tile edges align with the discontinuities.